© 2017 John et al. Pediatric femoral shaft fractures account for less than 2% of all fractures in children. However, these are the most common pediatric fractures necessitating hospitalization and are associated with prolonged hospital stay, prolonged immobilization and impose a significant burden on the healthcare system as well as caregivers. In this paper, the authors present a comprehensive review of epidemiology, aetiology, classification and managemement options of pediatric femoral shaft fractures. Keywords: Children, Elastic nailing, Femur, Fractures, Hip spica, Submuscular plating. Pediatric femoral shaft fractures are uncommon, constituting less than 2% of all fractures in children; yet they are a significant burden on healthcare systems and families as they are the most common fractures requiring hospitalization in children [1, 2]. These injuries often require prolonged immobilisation or surgery . This review will look at the epidemiology, classification and current concepts in the management of pediatric femoral shaft fractures. Pediatric shaft femur fractures are 2.6 times more common in boys than in girls [3-5]. A bimodal distribution has been noted, with the first peak occurring in the age group of 1-3 years (usually low energy) and the second peak during early adolescence period (high energy), which constitutes the majority of the fractures [3, 5]. Although, the etiology of the fracture varies with the age of the child, the most common cause of femur shaft fractures in children is fall from height and road traffic accidents [4, 6]. However, one should keep the suspicion of child abuse in mind while dealing with these fractures in young children as it has been observed that up to 80% of femur shaft fractures occurring in children before walking age are due to abuse [7, 8]. Coffey et al. reported that 67% of lower limb fractures in children less than 18 months of age were as a result of child abuse. In children more than 3 years of age, abuse is unlikely to cause femur fractures since bone at this age is significantly stronger in resisting both torque forces and direct blows [4, 6]. Stress fractures of the femoral shaft and neck, although uncommon, are increasingly being noticed in adolescent athletes participating in soccer, basketball, athletics etc. and account for 4% of all stress fractures in children [10-12]. A high index of suspicion is needed to diagnose undisplaced stress fractures in order to prevent their eventual progression to a displaced fracture [10-12]. There is no universal classification system available for pediatric shaft femur fractures. Fractures are usually classified descriptively either on the basis of i) configuration - transverse/spiral/oblique ii) comminution - comminuted or non-comminuted and iii) presence/absence of soft tissue coverage around fracture- open/closed. The most common type of fracture is a simple, transverse, non-comminuted, diaphyseal fracture accounting for more than 50% of the cases . According to the AO (Arbeitsgemeineschaft fur Osteosynthesefragen) paediatric comprehensive classification of long bone fractures, shaft femur fractures are classified as category 32-D . Sub-categories 32- D 4.1 (complete transverse with an obliquity of 30º or less) and 32-D 5.1 (complete oblique or spiral more than 300) are simple fractures whereas subcategories 32-D 4.2 (multi-fragmentary transverse 300 or less) and 32-D 5.2 (multi-fragmentary oblique or spiral more than 300) are unstable patterns . Pediatric femur shaft fractures tend to unite rapidly and have a tremendous remodelling potential. Consequently, a wide range of deformity of the initial healed bone is considered acceptable. The acceptable angulation in the coronal and sagittal planes varies from 300 at birth to 150 at 10 years. Rotational malalignment does not remodel and deformity more than 100 in the axial plane is not acceptable . Limb shortening of up to 15 mm can be compensated in children up to 12 years of age by growth acceleration . The decision to manage a femoral shaft fracture by conservative or operative means is affected by a wide number of variables, which include age and weight of patient, the type of fracture, associated injuries/polytrauma and socioeconomic status of the family . Age is the main predictor of the treatment (Table 1). Fractures in children below 6 years of age are usually managed non-operatively due to the excellent remodelling potential of this age group. Various conservative modalities used include Pavlik harness, traction (Bryant’s traction, skin traction and skeletal traction), hip spica and functional bracing. Immobilization in a Pavlik harness works well for infants up to 6 months of age whereas hip spica is preferred for older children . The treatment of fractures in the age group 5-16 years is controversial with multiple options available and no clear consensus on the preferred modality of management. Surgical options are external fixation, plating (conventional and submuscular bridge plating) and intramedullary nails which can be by flexible nails (titanium nail, Enders nail) or rigid nails . The different treatment options are discussed at length. Table 1. Summary of suitable treatment options available for management of pediatric shaft femur fractures according to age of the child. This orthosis is ideal for birth injuries with proximal or mid-shaft fractures in infants.1Both stable and unstable fractures can be managed using a Pavlik Harness and a wrap on around the thigh. The proximal fragment lies in flexion due to the pull of the iliopsoas; when the Pavlik harness is applied in moderate flexion and abduction, the distal fragment automatically aligns itself to the proximal fragment . The use of Pavlik harness in infants with femur fractures was popularised by Stannard et al. who noted acceptable alignment in all patients with less than 1cm shortening. Podezwa et al. compared hip spica application to Pavlik harness application in children less than 1 year of age in a retrospective study. There was no difference in the radiological outcomes in both the groups. They noted that infants treated with spica cast had lower pain scores compared to those treated with Pavlik harness; however, one-third of the patients on hip spicas had skin complications whereas none of those treated with Pavlik harness reported skin complications. Based on the observations of Podezwa et al. , Pavlik harness application is now the recommended treatment for shaft femur fractures in children less than 1 year of age. In children 1-6 years of age, hip spica casting has traditionally been the treatment of choice unless there are associated injuries, excessive shortening (>2cm), skin complications which can preclude application of hip spica [19, 20]. Based on the timing of application of the spica, hip spicas have been arbitrarily classified into “immediate” and “early” spicas. When the spica is applied within minutes of presentation to the clinic, it is called “immediate spica casting” whereas when the spica is applied a few days after the injury, it is termed as “early spica casting”. The ideal position for hip spica application has always been controversial. Numerous studies have reported excellent outcomes for ‘one and a half’ hip spica casting in the 90-90 position/ “sitting spica cast” (i.e both hips and knees in 900 of flexion) [21, 22]. Casting in the 90/90 position permits the child to be placed on a chair or to be easily carried in the lap of the parents and also obliterates the need of bedpans for toiletries . It has also been observed that knee flexion greater than 600 improves maintenance of length and reduction . However, Frick et al. observed that excessive traction with increased knee flexion increases the chances of compartment syndrome and skin sloughing. The position of the knee (lesser than 900 flexion), lesser traction and cast padding are critical to avoid this complication.1 According to a recent Cochrane review, the safe and effective position is 300 of abduction, 300 to 400 of flexion and external rotation at the hip . The fracture location may also the dictate the amount of flexion needed at hip with more proximally located fractures needing more amount of flexion . All patients should be observed for 24 hours after hip spica application to rule out neurovascular compromise and compartment syndrome . Advantages of spica are excellent union rates, low cost, good safety profile, reduced need of specialised surgical instrumentation/tools and low rate of complications like limb length discrepancy, non-union etc [26, 27]. The complications associated with spica casting are maintenance of personal hygiene, transportation difficulties and intolerance of the child to cast . It has been noted that the negative impact of spica casting is more on school going children (i.e. children more than 5 years of age) than in pre-school children . Of late, there has been a renewed interest in the concept of “walking spica” or “single-leg hip spica” for selected indications. The walking spica is ideal in stable, low energy fractures in toddlers [30, 31]. It is applied with the ipsilateral knee in 450 of flexion and the hip in 450 of flexion and 150 of external rotation. The hip should be extensively reinforced anteriorly to avoid breakage. Additional advantages offered by walking spica over conventional hip spica are improved function and care and reduced chances of spica syndrome [30-35]. The disadvantage is the increased chance of loss of reduction compared to conventional spica [30, 32]. Epps et al. reported that 90% children pulled to stand and 62% children walked independently by the end of the treatment with minimal complications. However, Flynn et al. in a comparative study noted that outcomes of children treated with walking and conventional spica were similar . Leu et al. too did not find a significant difference in radiological and functional outcomes between single leg and double leg spica casts at cast removal (mean 44 days in both groups). They observed that single-leg casts afforded more comfort during sitting and greater ease on leaving the family home. Fewer caregivers needed to take time off work in the single-cast group and for lesser time duration. Table 2. Summary of selected major studies on hip spica application in the management of pediatric femur shaft fractures. Cassinelli et al. 2005 Retrospective review 145 Immediate spica Acceptable alignment in all patients. Leu et al. 2012 RCT 52 Single leg spica v/s double leg spica Similar functional and radiological outcomes in both groups. Single-leg spica group was more likely to fit into car seats and chairs comfortably. Caregivers took less time off work. Single leg spica is effective and safe. The eponymous Bryant’s traction was introduced by Bryant in 1873, wherein vertical overhead traction was applied with both hips in 90o flexion and knees in full extension [36, 37]. Due to ensuing vascular complications in few patients, this method went out of vogue . Modified Bryant’s traction was described by Ferry et al.,  in 1966; knees were placed in 45o of flexion, which reduced vascular complications. Application of traction before spica casting/functional bracing is indicated in length unstable fractures provided the family members agree to the long period of immobilisation.1 The Thompson’s telescope test can be used to detect length unstable fractures . At the time of hip spica application, if > 3 cm shortening is demonstrable with gentle axial compression under fluoroscopic imaging, then the fracture is length unstable and traction should be used . Both skin and skeletal traction can be applied, depending on the weight of the child. Skeletal traction is ideally used when > 5 lb of traction is needed . The preferred choice of site for application of traction pin is the distal femur as proximal tibial pins have been known to cause recurvatum deformity subsequent to proximal tibial physeal plate damage and may also aggravate associated menisco-ligamentous injuries of the knee by over-distracting the knee joint [41-43]. It is the recommended mode of treatment when fracture femur is associated with severe soft tissue injury, head injury and/or polytrauma (damage control orthopaedics) or when the fracture is pathological in nature (Fig. 1) [1, 44]. Fig. (1). Preoperative and post operative images of an open subtrochanteric femur fracture in a 7 year old male managed by external fixator. External fixator application is associated with complications manifold [45-48]. The main complication is pin tract infection which can occur in up to 72% of patients . Other complications are secondary fractures after implant removal with an incidence ranging from 1% to 22% [45-49]. This means that the fixator should be left in situ for a long period of time until bridging callus is seen in atleast 3 cortices in 2 orthogonal radiological views. They are difficult to use in proximal/distal fractures due to difficulty in placement in the physeal regions. Hip or knee joint stiffness may develop when major soft tissue injuries are present . Fixator removal is usually done after 3-4 months when bridging callus is noted in at least 3 of the 4 cortices on AP and lateral views. An alternative strategy (“portable traction”) is to remove fixator at around 6-8 weeks when early callus is noted and to apply a walking spica. This method minimises stress shielding and allows pin tracts to ossify with the spica acting as a protective splint . Table 3. Summary of selected major studies on external fixator (EF) application in the management of pediatric femur shaft fractures. 8.5% pin tract infection Recommended Primary EF use. Sola et al. 1999 Retrospective study 39 Orthofix EF Auxiliary pin used in 16 cases Use of auxiliary pin reduced malunion and re-manipulation rates. No complications in nailing group Flexible nail use recommended. EF recommended only for open/severely comminuted fractures. Developed by the Nancy group in France [58, 59] in the early 1980’s, this is the most popular method of fracture fixation in the age group of 5-11 years as fractures tend to angulate and/or shorten with spicas due to the bulkier frame. Flexible intramedullary nails are load sharing devices which offer good fixation (relative stability and subsequent fracture union by indirect bone healing/callus formation), are relatively cheaper and have a short learning curve as it is relatively easier to insert and remove these nails . Bone growth is affected minimally, as the need to cross physis can be avoided with these nails; the mean femur overgrowth is 1.2 mm. Operating time and blood loss is significantly reduced [60, 61]. The preferred technique for insertion of these nails is a retrograde technique with 2 small incisions (medial and lateral) just above the distal femoral physis (Fig. 2) . Antegrade nailing from the subtrochanteric area avoids post-operative knee complications . The diameter of the nail should be two-fifths of the diameter of the medullary canal and should be calculated preoperatively . During insertion, it is important to prebend the nails so that the apex of the bend lies across the fracture site [59, 60, 63]. The elastic deformation of the pre-bent nail in a straight medullary canal imparts a bending moment which tends to angulate the fracture. The insertion of another nail of the same diameter from the opposite side balances this moment leading to good stability against bending and torsional forces. This principle is referred to as ‘trifocal buttressing’ [59, 60, 63]. Frick et al. observed that retrograde double C configuration is better than antegrade C or S pattern as it offers greater resistance to torsional forces. Fig. (2). Preoperative and postoperative images of a femoral shaft fracture in a 6 year old girl treated by retrograde elastic stable intramedullary nailing. Complications include excessive shortening which leads to nail protrusion and limb length discrepancy. The most common complication is pain or skin irritation at the nail insertion site caused by a prominent nail end [63, 66]. Higher rate of unplanned surgeries and malunions have been observed in length unstable fractures and heavy (>50 kg) children [63, 65-67]. Frick et al. conducted a biomechanical study to evaluate the stability of simulated transverse and comminuted femoral fractures after retrograde and antegrade flexible nail insertion in five synthetic adolescent-sized femoral bone models each respectively. They noted that retrograde nail fixation demonstrated significantly less axial range of motion and greater torsional stiffness than antegrade fixation in both fracture patterns. However, antegrade nails demonstrated greater resistance to shortening . Mehlman et al. conducted a mechanical study to determine whether the stability of ESIN constructs differ in terms of antegrade versus retrograde insertion for the fixation of pediatric distal-third transverse femoral-shaft fractures in 10 synthetic composite adolescent-sized femur models. All the specimens were subjected to 4-point bending followed by axial torsion. They observed that flexural stiffness was significantly greater in the retrograde group (350±72 N/mm) compared with antegrade (195±95 N/mm; p = 0.02). Although antegrade nail insertion is recommended for distal-third femur fractures, Mehlman et al. demonstrated that given satisfactory cortical starting points in the distal fragment, retrograde insertion provides greater stability . Wall et al. compared stainless steel to titanium elastic nails and found that the cheaper stainless steel nails were superior to titanium nails owing to a lesser rate of malunion (6.3% vs. 23.2%). However, in an experimental study by Perez et al. it was noted that stainless steel nails were associated with increased gap closure and nail slippage; titanium nails, on the other hand, offered greater stability. It was also observed that stainless steel nails hamper re-modelling and consequently increased the chances of re-fracture . Linhart and Roposch  described a method of “locking” flexible Enders rods to maintain leg length and alignment without compromising early postoperative mobility. Cramer et al. reported a different locking technique and reported no clinically significant malunions, motion loss, or leg length discrepancy. They recommended Enders nail over TENS system due to the locking capability of Enders nails although they are limited by the canal size . Ellis et al. conducted a retrospective review to study locked versus unlocked Ender’s nails in length unstable femur shaft fractures (defined as either a comminuted fracture or a spiral fracture longer than twice the diameter of the femoral shaft). They identified a total of 107 length unstable fractures fixed with Enders nails, of which 37 cases had both Enders rods “locked” through the eyelet in the distal femur with a 2.7mm fully threaded cortical screw. They observed that shortening of the femur and nail migration at 1-6 weeks post-operatively was significantly greater in the non-locked nails group. Also, there were significantly more clinical complaints in non-locked group including limp, clinical shortening, and painful, palpable rods. Based on these observations, they concluded that locked Enders rods are an excellent option to prevent shortening in length unstable fractures and result in no additional complications or added surgical time or increased blood loss . Table 4. Summary of selected major studies on ESIN in the management of pediatric femur shaft fractures. Flynn et al. 2001 Prospective Review 10.2 58 ESIN Excellent/ satisfactory outcome in 57 of the 58 cases TENS may be an ideal implant to stabilize paediatric femur fractures. No malunion. ESIN is treatment of choice in 6-12 year age group. Narayana et al. 2004 Retrospective study 13.7 78 ESIN Proper nail advancement and fracture comminution are important factors regarding complications of ESIN Ideal implant for pediatric femur fractures. Anastasopoulos et al. 2010 Retrospective study 10.3 36 ESIN 50% children had a LLD without functional disability. Rigid intramedullary nails initially fell out of favour compared to flexible intramedullary nails as these nails had a piriformis entry and hence were associated with avascular necrosis (AVN) of the femur head and with injuries to the growth plate leading to growth arrest . However, with the introduction of trochanteric entry nails (Fig. 3), which has reduced the chances of osteonecrosis, the use of rigid intramedullary nails in adolescents is on the rise again [86, 87]. Fig. (3). 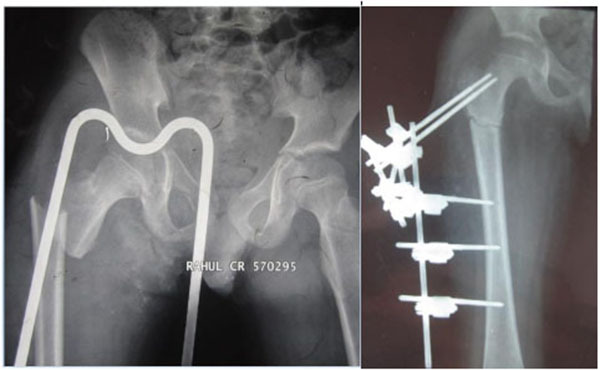 Pre-operative and post-operative radiographs of an 11 year old male with femoral shaft fracture treated by a trochanteric entry rigid intramedullary nail. Current literature suggests that rigid intramedullary nail with a trochanteric entry point is the preferred mode of fixation of shaft femur fractures in adolescents . However, growth disturbance due to physeal plate damage is still a concern with these nails and hence it is not preferred for use in children less than 12 years. Table 5. Summary of selected major studies on rigid intramedullary interlocking nails in the management of pediatric femur shaft fractures. Beaty et al. 1994 Prospective Study 10-15 30 IM nail 100% fracture union. 1 case of asymptomatic AVN of femur head IM nail reasonable alternative for the treatment of isolated femur shaft fractures in adolescents with polytrauma. et al. 2000 Prospective cohort study 10-16 48 IM nail All fractures united. No significant deformity/shortening/malunions/ AVN. IM nailing through trochanteric point is safe & effective for treating femur fractures in adolescents. et al. 2006 Prospective Study 11-16 20 IM nail No major complications. All fractures healed within 9 weeks and patients returned to pre-injury activity level. Excellent results with good surgical technique involving GT entry point. Townsend & Hoffinger et al. 2000 Retrospective Study 12-17 34 IM nail No patient had AVN of the femoral head or other major complications. The trochanteric tip entry point is recommended for IM nailing of femoral shaft fractures in children and adolescents. Pediatric trauma surgeons have largely moved away from the traditional open reduction and compression plating to the more modern submuscular bridge plating which offers stability without disturbing the vascularity of the fracture fragments hence leading to early union. Submuscular bridge plating provides excellent stability; it is especially useful in the management of proximal/distal fractures that are not suitable for IM nailing/external fixation (Fig. 4) [93, 94]. This method can also be used in pathologic fractures and associated head injuries. Disadvantages are the difficulty in implant removal due to cold welding of locking screws to the plate, significant blood loss and relatively higher learning curve [93-100]. Table 6. Summary of selected major studies on submuscular bridge plating in the management of pediatric femur shaft fractures. of adolescent femoral fracture with precontoured plate is effective. Sink et al. 2006 Retrospective study 27 Submuscular Bridge Plating 100% union rate. No intraoperative/postoperative complications Reasonable option for operative stabilization of comminuted and unstable fractures. Agus et al. 2003 Retrospective Study 11.3 14 Submuscular Bridge Plating Mean healing time 12.4 weeks. Angulation >100 seen in 1 patient. Bridge plating is effective treatment method for the closed comminuted fractures of the proximal and distal thirds. Hammad et al. 2008 Retrospective study 9.4 15 Submuscular Bridge Plating 100% union rate. Screw failure in form of bending or breakage occurred in 2 patients, without clinical consequences. Average femoral lengthening 2.3 mm in 6 patients and 2 mm tibial lengthening in 4 patients. 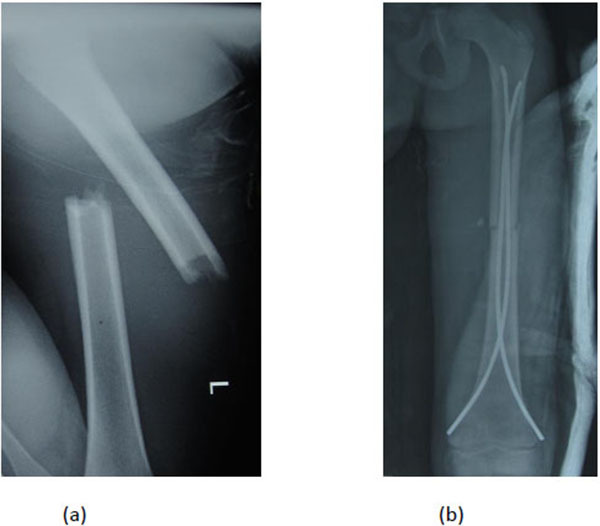 Reliable method for the treatment of femoral shaft fractures in skeletally immature patients. et al. 2013 Retrospective Review 9 58 Submuscular Bridge Plating All fractures healed well and all patients returned to full activity. 1 patient had implant failure and other, deep infection in an old open fracture. Submuscular bridge plating is preferred method for unstable fractures or fractures of the proximal and distal shaft. Fig. (4). 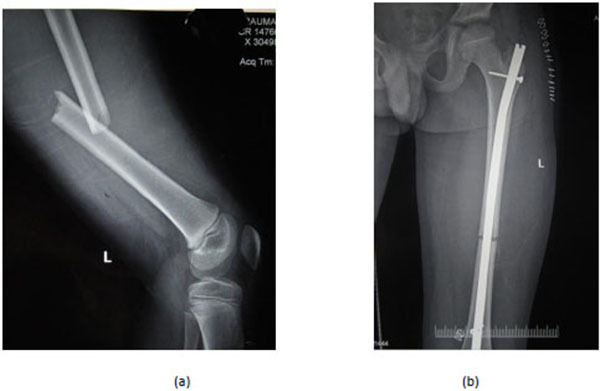 Preoperative and post operative radiographs of a comminuted subtrochanteric fracture with extension into the femoral shaft managed by submuscular bridge plating. Femoral shaft fractures in children are amongst the commonest fractures necessitating hospitalization. The major determinant of treatment modality is age of the child. Fractures in children below 6 years of age can be managed non-operatively with excellent outcomes. Elastic stable intramedullary nails are preferred for children < 11 years of age or those with body weight < 50 kg with a length stable transverse or short oblique fracture. Length unstable fractures and fractures at the proximal ends of femur may be managed by submuscular plating or external fixation. For children above 11 years of age or those with body weight > 50 kg, rigid intramedullary nailing or submuscular plating is preferred. Piriformis fossa entry nails should be avoided to prevent the complication of avascular necrosis of femoral head. Flynn JM, Skaggs D. Femoral shaft fractures. In: Flynn JM, Skaggs D, Waters P, Eds. Rockwood & Wilkins’ Fractures in Children. Philadelphia: Wolters Kluwer 2014; pp. 987-1026. Loder RT, ODonnell PW, Feinberg JR. Epidemiology and mechanisms of femur fractures in children. J Pediatr Orthop 2006; 26(5): 561-6. Rewers A, Hedegaard H, Lezotte D, et al. Childhood femur fractures, associated injuries, and sociodemographic risk factors: a population-based study. Pediatrics 2005; 115(5): e543-52. Hedlund R, Lindgren U. The incidence of femoral shaft fractures in children and adolescents. J Pediatr Orthop 1986; 6(1): 47-50. Hinton RY, Lincoln A, Crockett MM, Sponseller P, Smith G. Fractures of the femoral shaft in children. Incidence, mechanisms, and sociodemographic risk factors. J Bone Joint Surg Am 1999; 81(4): 500-9. Daly KE, Calvert PT. Accidental femoral fracture in infants. Injury 1991; 22(4): 337-8. Beals RK, Tufts E. Fractured femur in infancy: the role of child abuse. J Pediatr Orthop 1983; 3(5): 583-6. Blakemore LC, Loder RT, Hensinger RN. Role of intentional abuse in children 1 to 5 years old with isolated femoral shaft fractures. J Pediatr Orthop 1996; 16(5): 585-8. Coffey C, Haley K, Hayes J, Groner JI. The risk of child abuse in infants and toddlers with lower extremity injuries. J Pediatr Surg 2005; 40(1): 120-3. Burks RT, Sutherland DH. Stress fracture of the femoral shaft in children: report of two cases and discussion. J Pediatr Orthop 1984; 4(5): 614-6. Toren A, Goshen E, Katz M, Levi R, Rechavi G. Bilateral femoral stress fractures in a child due to in-line (roller) skating. Acta Paediatr 1997; 86(3): 332-3. Meaney JE, Carty H. Femoral stress fractures in children. Skeletal Radiol 1992; 21(3): 173-6. Slongo TF, Audigé L. Fracture and dislocation classification compendium for children: the AO pediatric comprehensive classification of long bone fractures (PCCF). J Orthop Trauma 2007; 21(10)(Suppl. ): S135-60. Resch H, Oberhammer J, Wanitschek P, Seykora P. Rotational deformities following pediatric femoral shaft fracture. Aktuelle Traumatol 1989; 19(2): 77-81. Malkawi H, Shannak A, Hadidi S. Remodeling after femoral shaft fractures in children treated by the modified blount method. J Pediatr Orthop 1986; 6(4): 421-9. Kocher MS, Sink EL, Blasier RD, et al. American Academy of Orthopaedic Surgeons clinical practice guideline on treatment of pediatric diaphyseal femur fracture. J Bone Joint Surg Am 2010; 92(8): 1790-2. Stannard JP, Christensen KP, Wilkins KE. Femur fractures in infants: a new therapeutic approach. J Pediatr Orthop 1995; 15(4): 461-6. Podeszwa DA, Mooney JF III, Cramer KE, Mendelow MJ. Comparison of Pavlik harness application and immediate spica casting for femur fractures in infants. J Pediatr Orthop 2004; 24(5): 460-2. Irani RN, Nicholson JT, Chung SM. Long-term results in the treatment of femoral-shaft fractures in young children by immediate spica immobilization. J Bone Joint Surg Am 1976; 58(7): 945-51. Staheli LT. Femoral and tibial growth following femoral shaft fracture in childhood. Clin Orthop Relat Res 1967; 55(55): 159-63. Miller ME, Bramlett KW, Kissell EU, Niemann KM. Improved treatment of femoral shaft fractures in children. The pontoon 9090 spica cast. Clin Orthop Relat Res 1987; (219): 140-6. McCarthy RE. A method for early spica cast application in treatment of pediatric femoral shaft fractures. J Pediatr Orthop 1986; 6(1): 89-91. Illgen R II, Rodgers WB, Hresko MT, Waters PM, Zurakowski D, Kasser JR. Femur fractures in children: treatment with early sitting spica casting. J Pediatr Orthop 1998; 18(4): 481-7. Large TM, Frick SL. Compartment syndrome of the leg after treatment of a femoral fracture with an early sitting spica cast. A report of two cases. J Bone Joint Surg Am 2003; 85-A(11): 2207-10. Madhuri V, Dutt V, Gahukamble AD, Tharyan P. Interventions for treating femoral shaft fractures in children and adolescents 2014. Infante AF Jr, Albert MC, Jennings WB, Lehner JT. Immediate hip spica casting for femur fractures in pediatric patients. A review of 175 patients. Clin Orthop Relat Res 2000; (376): 106-12. Ferguson J, Nicol RO. Early spica treatment of pediatric femoral shaft fractures. J Pediatr Orthop 2000; 20(2): 189-92. Hughes BF, Sponseller PD, Thompson JD. Pediatric femur fractures: effects of spica cast treatment on family and community. J Pediatr Orthop 1995; 15(4): 457-60. Hunter JB. Femoral shaft fractures in children. Injury 2005; 36: A86-93. Flynn JM, Garner MR, Jones KJ, et al. The treatment of low-energy femoral shaft fractures: a prospective study comparing the walking spica with the traditional spica cast. J Bone Joint Surg Am 2011; 93(23): 2196-202. Leu D, Sargent MC, Ain MC, Leet AI, Tis JE, Sponseller PD. Spica casting for pediatric femoral fractures: a prospective, randomized controlled study of single-leg versus double-leg spica casts. J Bone Joint Surg Am 2012; 94(14): 1259-64. Epps HR, Molenaar E, Oconnor DP. Immediate single-leg spica cast for pediatric femoral diaphysis fractures. J Pediatr Orthop 2006; 26(4): 491-6. Cassinelli EH, Young B, Vogt M, Pierce MC, Deeney VF. Spica cast application in the emergency room for select pediatric femur fractures. J Orthop Trauma 2005; 19(10): 709-16. Czertak DJ, Hennrikus WL. The treatment of pediatric femur fractures with early 9090 spica casting. J Pediatr Orthop 1999; 19(2): 229-32. Mubarak SJ, Frick S, Sink E, Rathjen K, Noonan KJ. Volkmann contracture and compartment syndromes after femur fractures in children treated with 90/90 spica casts. J Pediatr Orthop 2006; 26(5): 567-72. Bryant T. The Practice of Surgery. Philadelphia, PA 1873. Cole WH. Results of treatment of fractured femurs in children with special reference to Bryant’s overhead traction. Arch Surg 1922; 5: 702-16. Nicholson JT, Foster RM, Heath RD. Bryants traction; a provocative cause of circulatory complications. J Am Med Assoc 1955; 157(5): 415-8. Ferry AM, Edgar MS Jr. Modified bryants traction. J Bone Joint Surg Am 1966; 48(3): 533-6. Thompson JD, Buehler KC, Sponseller PD, et al. Shortening in femoral shaft fractures in children treated with spica cast. Clin Orthop Relat Res 1997; (338): 74-8. Aronson DD, Singer RM, Higgins RF. Skeletal traction for fractures of the femoral shaft in children. A long-term study. J Bone Joint Surg Am 1987; 69(9): 1435-9. Dencker H. Wire traction complications associated with treatment of femoral shaft fractures. Acta Orthop Scand 1964; 35: 158-63. Ryan JR. 9090 skeletal femoral traction for femoral shaft fractures in children. J Trauma 1981; 21(1): 46-8. Mooney JF. The use of ’damage control orthopaedics’ techniques in children with segmental open femur fractures. J Pediatr Orthop 2012; 21(5): 400-3. Miner T, Carroll KL. Outcomes of external fixation of pediatric femoral shaft fractures. J Pediatr Orthop 2000; 20(3): 405-10. Skaggs DL, Leet AI, Money MD, Shaw BA, Hale JM, Tolo VT. Secondary fractures associated with external fixation in pediatric femur fractures. J Pediatr Orthop 1999; 19(5): 582-6. Gregory P, Pevny T, Teague D. Early complications with external fixation of pediatric femoral shaft fractures. J Orthop Trauma 1996; 10(3): 191-8. Hedin H, Hjorth K, Larsson S, Nilsson S. Radiological outcome after external fixation of 97 femoral shaft fractures in children. Injury 2003; 34(4): 287-92. Evanoff M, Strong ML, MacIntosh R. External fixation maintained until fracture consolidation in the skeletally immature. J Pediatr Orthop 1993; 13(1): 98-101. Aronson J, Tursky EA. External fixation of femur fractures in children. J Pediatr Orthop 1992; 12(2): 157-63. Matzkin EG, Smith EL, Wilson A, Murray PC. External fixation of pediatric femur fractures with cortical contact. Am J Orthop 2006; 35(11): 498-501. Bar-On E, Sagiv S, Porat S. External fixation or flexible intramedullary nailing for femoral shaft fractures in children. A prospective, randomised study. J Bone Joint Surg Br 1997; 79(6): 975-8. Kapukaya A, Subaşi M, Necmioğlu S, Arslan H, Kesemenli C, Yildirim K. Treatment of closed femoral diaphyseal fractures with external fixators in children. Arch Orthop Trauma Surg 1998; 117(6-7): 387-9. Davis TJ, Topping RE, Blanco JS. External fixation of pediatric femoral fractures. Clin Orthop Relat Res 1995; (318): 191-8. Sola J, Schoenecker PL, Gordon JE. External fixation of femoral shaft fractures in children: enhanced stability with the use of an auxiliary pin. J Pediatr Orthop 1999; 19(5): 587-91. Domb BG, Sponseller PD, Ain M, Miller NH. Comparison of dynamic versus static external fixation for pediatric femur fractures. J Pediatr Orthop 2002; 22(4): 428-30. Barlas K, Beg H. Flexible intramedullary nailing versus external fixation of paediatric femoral fractures. Acta Orthop Belg 2006; 72(2): 159-63. Prévot J, Lascombes P, Ligier JN. The ECMES (Centro-Medullary Elastic Stabilising Wiring) osteosynthesis method in limb fractures in children. Principle, application on the femur. Apropos of 250 fractures followed-up since 1979. Chirurgie 1993-1994; 119(9): 473-6. [in French]. Ligier JN, Metaizeau JP, Prevot J, Lascombes P. Elastic stable intramedullary nailing of femoral shaft fractures in children. J Bone Joint Surg Br 1988; 70(1): 74-7. Flynn JM, Hresko T, Reynolds RA, Blasier RD, Davidson R, Kasser J. Titanium elastic nails for pediatric femur fractures: a multicenter study of early results with analysis of complications. J Pediatr Orthop 2001; 21(1): 4-8. Bhuyan BK, Mohan Singh S. Titanium elastic nailing in pediatric femoral diaphyseal fractures in the age group of 516 years - A short term study. J Clin Orthop Trauma 2014; 5(4): 203-10. Bourdelat D. Fracture of the femoral shaft in children: advantages of the descending medullary nailing. J Pediatr Orthop B 1996; 5(2): 110-4. Lascombes P, Haumont T, Journeau P. Use and abuse of flexible intramedullary nailing in children and adolescents. J Pediatr Orthop 2006; 26(6): 827-34. Fricka KB, Mahar AT, Lee SS, Newton PO. Biomechanical analysis of antegrade and retrograde flexible intramedullary nail fixation of pediatric femoral fractures using a synthetic bone model. J Pediatr Orthop 2004; 24(2): 167-71. Moroz LA, Launay F, Kocher MS, et al. Titanium elastic nailing of fractures of the femur in children. Predictors of complications and poor outcome. J Bone Joint Surg Br 2006; 88(10): 1361-6. Luhmann SJ, Schootman M, Schoenecker PL, Dobbs MB, Gordon JE. Complications of titanium elastic nails for pediatric femoral shaft fractures. J Pediatr Orthop 2003; 23(4): 443-7. Parikh SN, Jain VV, Denning J, et al. Complications of elastic stable intramedullary nailing in pediatric fracture management: AAOS exhibit selection. J Bone Joint Surg Am 2012; 94(24): e184. Mehlman CT, Nemeth NM, Glos DL. Antegrade versus retrograde titanium elastic nail fixation of pediatric distal-third femoral-shaft fractures: a mechanical study. J Orthop Trauma 2006; 20(9): 608-12. Wall EJ, Jain V, Vora V, Mehlman CT, Crawford AH. Complications of titanium and stainless steel elastic nail fixation of pediatric femoral fractures. J Bone Joint Surg Am 2008; 90(6): 1305-13. Perez A, Mahar A, Negus C, Newton P, Impelluso T. A computational evaluation of the effect of intramedullary nail material properties on the stabilization of simulated femoral shaft fractures. Med Eng Phys 2008; 30(6): 755-60. Linhart WE, Roposch A. Elastic stable intramedullary nailing for unstable femoral fractures in children: preliminary results of a new method. J Trauma 1999; 47(2): 372-8. Cramer KE, Tornetta P III, Spero CR, Alter S, Miraliakbar H, Teefey J. Ender rod fixation of femoral shaft fractures in children. Clin Orthop Relat Res 2000; (376): 119-23. Ellis HB, Ho CA, Podeszwa DA, Wilson PL. A comparison of locked versus nonlocked Enders rods for length unstable pediatric femoral shaft fractures. J Pediatr Orthop 2011; 31(8): 825-33. Aktekin CN, Oztürk AM, Altay M, Toprak A, Ozkurt B, Tabak AY. Flexible intramedullary nailing of children. Ulus Travma Acil Cerrahi Derg 2007; 13(2): 115-21. Carey TP, Galpin RD. Flexible intramedullary nail fixation of pediatric femoral fractures. Clin Orthop Relat Res 1996; (332): 110-8. Singh R, Sharma SC, Magu NK, Singla A. Titanium elastic nailing in pediatric femoral diaphyseal fractures. Indian J Orthop 2006; 40(1): 29-34. Li Y, Stabile KJ, Shilt JS. Biomechanical analysis of titanium elastic nail fixation in a pediatric femur fracture model. J Pediatr Orthop 2008; 28(8): 874-8. Narayanan UG, Hyman JE, Wainwright AM, Rang M, Alman BA. Complications of elastic stable intramedullary nail fixation of pediatric femoral fractures, and how to avoid them. J Pediatr Orthop 2004; 24(4): 363-9. Sagan ML, Datta JC, Olney BW, Lansford TJ, McIff TE. 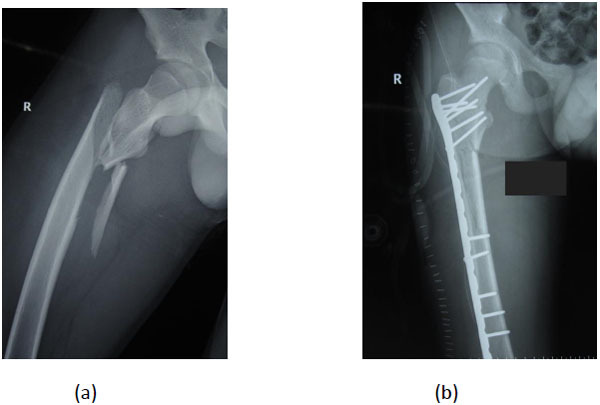 Residual deformity after treatment of pediatric femur fractures with flexible titanium nails. J Pediatr Orthop 2010; 30(7): 638-43. Reynolds RA, Legakis JE, Thomas R, Slongo TF, Hunter JB, Clavert JM. Intramedullary nails for pediatric diaphyseal femur fractures in older, heavier children: early results. J Child Orthop 2012; 6(3): 181-8. Houshian S, Gøthgen CB, Pedersen NW, Harving S. Femoral shaft fractures in children: elastic stable intramedullary nailing in 31 cases. Acta Orthop Scand 2004; 75(3): 249-51. Anastasopoulos J, Petratos D, Konstantoulakis C, Plakogiannis C, Matsinos G. Flexible intramedullary nailing in paediatric femoral shaft fractures. Injury 2010; 41(6): 578-82. Sink EL, Gralla J, Repine M. Complications of pediatric femur fractures treated with titanium elastic nails: a comparison of fracture types. J Pediatr Orthop 2005; 25(5): 577-80. Beaty JH, Austin SM, Warner WC, Canale ST, Nichols L. Interlocking intramedullary nailing of femoral-shaft fractures in adolescents: preliminary results and complications. J Pediatr Orthop 1994; 14(2): 178-83. Keeler KA, Dart B, Luhmann SJ, et al. Antegrade intramedullary nailing of pediatric femoral fractures using an interlocking pediatric femoral nail and a lateral trochanteric entry point. J Pediatr Orthop 2009; 29(4): 345-51. Hosalkar HS, Pandya NK, Cho RH, Glaser DA, Moor MA, Herman MJ. Intramedullary nailing of pediatric femoral shaft fracture. J Am Acad Orthop Surg 2011; 19(8): 472-81. Reeves RB, Ballard RI, Hughes JL. Internal fixation versus traction and casting of adolescent femoral shaft fractures. J Pediatr Orthop 1990; 10(5): 592-5. Kirby RM, Winquist RA, Hansen ST Jr. Femoral shaft fractures in adolescents: a comparison between traction plus cast treatment and closed intramedullary nailing. J Pediatr Orthop 1981; 1(2): 193-7. Momberger N, Stevens P, Smith J, Santora S, Scott S, Anderson J. Intramedullary nailing of femoral fractures in adolescents. J Pediatr Orthop 2000; 20(4): 482-4. Kanellopoulos AD, Yiannakopoulos CK, Soucacos PN. Closed, locked intramedullary nailing of pediatric femoral shaft fractures through the tip of the greater trochanter. J Trauma 2006; 60(1): 217-22. Townsend DR, Hoffinger S. Intramedullary nailing of femoral shaft fractures in children via the trochanter tip. Clin Orthop Relat Res 2000; (376): 113-8. Hedequist DJ, Sink E. Technical aspects of bridge plating for pediatric femur fractures. J Orthop Trauma 2005; 19(4): 276-9. Li Y, Hedequist DJ. Submuscular plating of pediatric femur fracture. J Am Acad Orthop Surg 2012; 20(9): 596-603. Eidelman M, Ghrayeb N, Katzman A, Keren Y. Submuscular plating of femoral fractures in children: the importance of anatomic plate precontouring. J Pediatr Orthop B 2010; 19(5): 424-7. Sink EL, Hedequist D, Morgan SJ, Hresko T. Results and technique of unstable pediatric femoral fractures treated with submuscular bridge plating. J Pediatr Orthop 2006; 26(2): 177-81. Kanlic EM, Anglen JO, Smith DG, Morgan SJ, Pesántez RF. Advantages of submuscular bridge plating for complex pediatric femur fractures. Clin Orthop Relat Res 2004; (426): 244-51. Ağuş H, Kalenderer O, Eryanilmaz G, Omeroğlu H. Biological internal fixation of comminuted femur shaft fractures by bridge plating in children. J Pediatr Orthop 2003; 23(2): 184-9. Hammad A. Locking plate construct for femoral shaft fractures in skeletally immature patients. Acta Orthop Belg 2008; 74(5): 630-5. Abdelgawad AA, Sieg RN, Laughlin MD, Shunia J, Kanlic EM. Submuscular bridge plating for complex pediatric femur fractures is reliable. Clin Orthop Relat Res 2013; 471(9): 2797-807.